The markets were sloppy on one of the lightest volume days of the year so far. The market is caught between daily sell divergences versus short term pullbacks in an uptrend. Dow needs leadership from somewhere – perhaps oil shares as the cahrt of XOM above shows? If not, it can continue to fluctuate in a trading range till price gets closer to the daily EMA. The short term trin is overbought. The RSI readings on daily indexes are overbought. 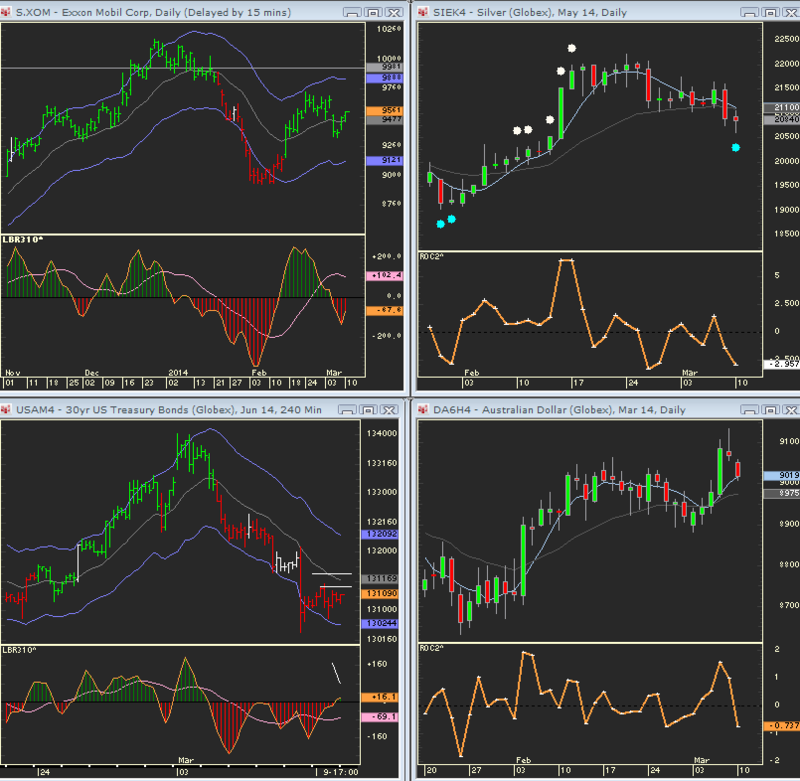 The short term closing tick and summation tick are mildly oversold though – mixed bag. A further reaction UP in the bonds sets up a Sell Short day. They had a dead cat bounce so far on MOnday. Grains are looking a bit toppy after the bean’s Sell Short day. However, there are pinball buys so further downside might be limited. A moring push down be a Buy opportunity. Copper Silver Gold all have Buy Days on the 2 period ROC. Not sure where the DOW is going to get leadership.